Snyder “Favors” State Action on “Internet Taxes!” Governor Rick Snyder said Wednesday the Legislature should tackle the problem of collecting sales tax on Internet purchases instead of waiting for action by Congress as he’s previously advocated. 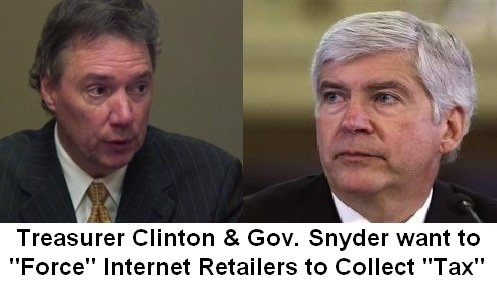 Snyder’s shifting view on the issue came one day after The Detroit News first reported his newly appointed state treasurer, Kevin Clinton, came out in favor of the so-called “Main Street Fairness Act” legislation aimed at forcing all Internet retailers to collect the sales tax. Main Street Fairness Act was introduced by a Democrat.